The Mosque-Cathedral of Cordoba is the most important monument in western Islam and one of the most amazing in the world. In its history summarizes the complete evolution of Umayyad in Spain, in addition to Gothic, Renaissance and Baroque Christian construction. This impressive specimen of the eighth century is by its extension (23,000 m2) the third mosque in the world. The mosque, which is Cathedral at the same time represents a mosaic of different cultures and architectural styles that were being added during the nine centuries which lasted construction, additions or renovations. Inside you can see contributions Hispanic-Roman and Visigoth, influences Syrian, Persian and Byzantine, a very peculiar style that launched the Spanish-Moorish art or Caliphate style. This architectural style will live on through the Taifa kingdoms, art Nazarite, and through the Christian kingdoms in the Moorish style (of Muslims in reconquered territory without changing their religion) and the art of the Mozarabic (Christian coexisted with the Moors in the Reconquest). The construction of the mosque was started by Abderraman I, in 785, on the ruins of a Visigothic church, inspired Umayyad mosque in Jerusalem. The result of this first stage of construction was a harmonious room 11 ships with 110 marble and granite columns with early Christian and Byzantine Roman capitals. Above them a double series of horseshoe arches and semicircular constituted an unprecedented architectural novelty. The play of light and shadows that offer the limestone and brick arches creates a unique atmosphere. In 833 Abderraman II expands, adding eight arches. The columns that hold it are white marble from the Roman theater in Mérida. Eleven capitals are Arabs, and the rest are Roman and postromanos. In 961 Abderraman II provides the greatest treasures that today is the mosque: the Mihrab, with its precious and exuberant decoration in carved marble and central octagonal dome of the Kliba interlaced arches, both considered masterpieces of world art. The latest and greatest enlargement is due to Mansur, who in 987, nearly doubled its size. From this period are the blue marble columns with composite capitals, and reddish brown marble with Corinthian capitals. 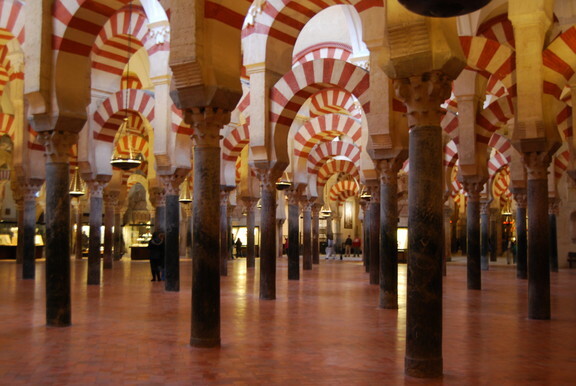 The Mosque of Cordoba additionally has two singularities that distinguish it from other mosques in the world: His guidance, as it looks to Mecca. In it we have tried to see the nostalgia I felt for Damascus Rahman expressed by him in his poetry. For the truth is that the Cordoba Mosque is oriented to the mosques of Damascus and Mecca. The other uniqueness is its decentralized location Mihrab. This is due to the expansion that made Almanzor, who had to make it on the east side, south as he ran into the river Guadalquivir and the West was the palace of the Caliph. The most important parts of the building are the old minaret or tower, the courtyard and prayer hall. The minaret was built by Abderraman III and become the current baroque tower late sixteenth century. The original courtyard was expanded on by Abderrahman III and Almanzor in the tenth century The cloisters are a product of total refurbishment carried out in the first decades of the sixteenth century. Under the orange there is a large cistern that secured water for the purification of Muslims. Abderrahman Stage I: On the old church of San Vicente, work began in the ninth decade of the eighth century and may be constructed in a period not exceeding seven years, hence its great stylistic homogeneity. The result was a mosque of eleven ships columns created from different sources (Roman, Byzantine, Visigothic …) supporting decorative horseshoe arches and pillars supporting the arches above structural semicircular arches creating an original overlay white masonry arches and red brick. Abderrahman II Stage: During the reign of the Emir of Cordoba (821-852) and in times of peace and prosperity will add seven more sections Abdurrahman Mosque I, extending considerably to the south. The brackets are still old Visigothic columns reused, though it also appears the first Model Arab Corinthian capitals. « Great Smoky Mountains National Park.